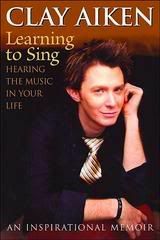 It has been a long time since I have read Clay Aiken’s book, Learning to Sing…Hearing The Music In Your Life. Something made me pick it up on Sunday. I really didn’t want to sit down and read it, but only look for some good quotes. When I taped the Primetime Live interview with Diane Sawyer, I was struck for the first time with how significantly my life had changed. We were setting up in an old nightclub in New York City. There were arches, banquettes, and a curtained stage. The floor was checkered. It reminded me of the sort of place where Sinatra might have performed. When I arrived, there were bright lights and cameras everywhere. People scurried around with clipboards and cell phones. There were producers and management teams and makeup artists and wardrobe consultants and camera operators and lighting experts and caterers and assistants for the assistants. I was stuck in a corner and I watched these masses of people rushing and bustling because of me. I wondered: Why? What had I really done? I sang. But I had always sung. Suddenly, people cared. Since then, my entire circle of friends has changed. The people I thought would be my peers really aren’t anymore. That’s all I read…it made me think about the huge changes that happened in Clay’s life. We have no idea!! No one could have predicted that Clay Aiken would become the next big pop star after Idol. No one would be prepared for the change that happened so quickly. In an interview with ABC News’ Diane Sawyer last year, Aiken said he has never taken himself too seriously, even during his run on American Idol. Aiken, 24, was a college kid teaching autistic kids when he auditioned for American Idol. The boyish-looking singer has a powerful and supple voice, but he struggled a bit with some aspects of performing during the competition. Even Aiken, looking back at that performance, admits that he isn’t the best dancer. And he shouldn’t have worn that tacky red jacket, either, he agreed. Do you remember the beginning of the program? Then, there was a clip of Clay driving with the radio on at 3:22 pm. Diane: …who inside is still just a goofy kid from Raleigh, North Carolina, hearing his song on the radio for the first time. Clay: Ah! Oh it’s me! I’ve never heard this song on the radio before! What an exciting time…what a time of change!! It is also interesting to note that according to the Nielsen ratings, the week previous to Clay’s visit, Primetime received a 5.7 score. The week Clay appeared on the show the ratings shot to 9.3!! What an amazing increase! Did you watch Clay live on Primetime Live? What was your reaction to the show? Loved these interviews musicfan, thanks so much for posting them again!! I loved that interview with Diane Sawyer.. What a life he had. And yet for all the negativity that was involved in it….Clay has forever stayed positive, caring and compassionate. I cannot tell you how much I admire him. He's a good man, with a big heart. Clay, as usual, was his very articulate self in that interview. Loved most of it, except when Dianne got too personal about Clay's sexual preference. Now, my reaction to the Simon critique was – "what a stick in the mud". And, to Clay – "you are too hard on yourself". Randy, Paula, and the other judge, along with the audience, got it right. Clay gave an exciting, fun, and very entertaining performance of Grease. Nothing wrong with the red leather jacket either. In my opinion, it meshed with the song's theme and music, and helped show a less serious side of Clay. Also loved the hip shake – how cute was that! Thanks for posting the interview videos and some of the ABC.com article. Seems like I just had to get my two cents in about that acerbic British guy's nonsense. Hopefully I did not stray too far off track. I agree with you 100%. I loved Clays performance and saw absolutely nothing wrong with the red jacket or hip shake. Heck, I screamed when he shook those hips. You go Clay. He was amazing. The interview about Vernon was heartbreaking and he's built his life around not becoming the same man as his dad. He's being the dad to Parker that I'm sure he wished for himself, so how can anyone blame him for taking time to be with him, I can't. I'll be here when he come back. I had never really seen this whole interview with Diane Sawyer. I discovered Clay on AI2…but, not until the Season was almost half over…but, I was a fan since that time. So, at first, I didn't even have a computer..so did not know of this interview. Got a computer shortly after and never missed a show. But, getting back to the Video…it was so sad to me when Clay was talking about his dad never calling him. He has turned into such a positive, happy and caring person. I really admire him for this…and now he has his own son…and he will be the best dad there is. Love the man!! Oh yes, I watched that show and taped it. Then lent the tape to a friend and never got it back! I’ve read “Learning to Sing” a couple of times. I keep it on my bookshelf with lots of articles about Clay. Thanks for posting the Diane Sawyer interview. I love the fact that Mike Nichols,her husband, chose Clay to play Sir Robin in Spamalot. My monitor is flickering (sorry, that's off topic but I'm a tad bit peeved since it's less than one year old). Anyway, I actually did see this interview at the time it aired (yay me!!!) Overall, it was excellent. I think Clay did a terrific job at answering all questions, some that had to have been very difficult for him to answer. Interesting how you took Clay's words and put them in this post. Good idea. I am so glad to see the videos again. It has been a long time and it is good to see them. It almost makes me cry!! Great interview and he was very honest when asked about his birth father. It was an amazing time I am sure for him – all the attention. Diane has stayed a good friend all these years later. never dissappoints. A true Gift – to me! and everyone else who loves him. This remains my favorite Clay interview. He was so sweet, adorable and vulnerable. I think his vulnerability is the quality I'd use to describe in one word why I love Clay. It breaks my heart when he talks about Vernon, and calls Ray Parker his dad. After LTS, I think we know the truth is that Clay has never known a father's love. Parker will never have to worry about that. Error: Error validating access token: Session has expired on Tuesday, 21-Aug-18 16:13:01 PDT. The current time is Thursday, 18-Apr-19 21:45:43 PDT.